NH365 090: The Detox Cleanse – A simple way to lose weight and have more energy – Sense of Urgency! (NaturalHealth365) Springtime is the PERFECT time to get rid of unwanted toxins in the body that kill our overall energy levels, increase our body weight and the risk of disease. Ask any qualified, integrative physician and they’ll tell you – detoxification is no longer a luxury, it’s a necessity living in the modern world. But, here’s a reality check. Being in the health and fitness industry for over 30 years, I know there are lots of detox programs on the market. But, most of them are selling you ineffective and, in many cases, harmful ingredients that don’t offer the results promised on the label. 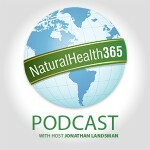 Today, on the NaturalHealth365 Podcast, we’ll talk about what real detoxification is all about and, most importantly, the best way to get started to deliver great results through a proven-system that’s safe and completely natural. How detoxification literally saved Robyn from years of sickness. How the “GreenSmoothieGirl” craze has helped millions of people to improve the quality of their life. What important detox lessons Robyn has learned in over 25 years. The unwanted toxins we find inside the body. A detailed look at what we MUST HAVE – in order to get rid of toxins. How often we should detox plus much more! Robyn Openshaw is the author of 15 books, including bestsellers The Green Smoothies Diet and 12 Steps to Whole Foods. Her latest book, 7 Days to Your High-Vibration Life, will be released by Simon & Schuster in October 2017. The post NH365 090: The Detox Cleanse – A simple way to lose weight and have more energy appeared first on Natural Health 365.